This project entailed removing a recently installed opening glass fire escape and installing a very different solution. The original installation contravened planning regulations, so the client had no choice but to have it removed and replaced. Our design took careful note of the client and planning officer’s brief. The escape hatch was to be “… walk-on glass at ground level and not visibly attached to the house wall… “. The original installation seemed to have missed this brief on all counts. Achieving ground level flush glass that can open and not leak in any condition is not easy. However, with our extensive use of marine grade stainless steel and comprehensive knowledge of yacht waterproofing, this was readily delivered. The glass roof-floor has three possible positions: Closed, Open and Vent. 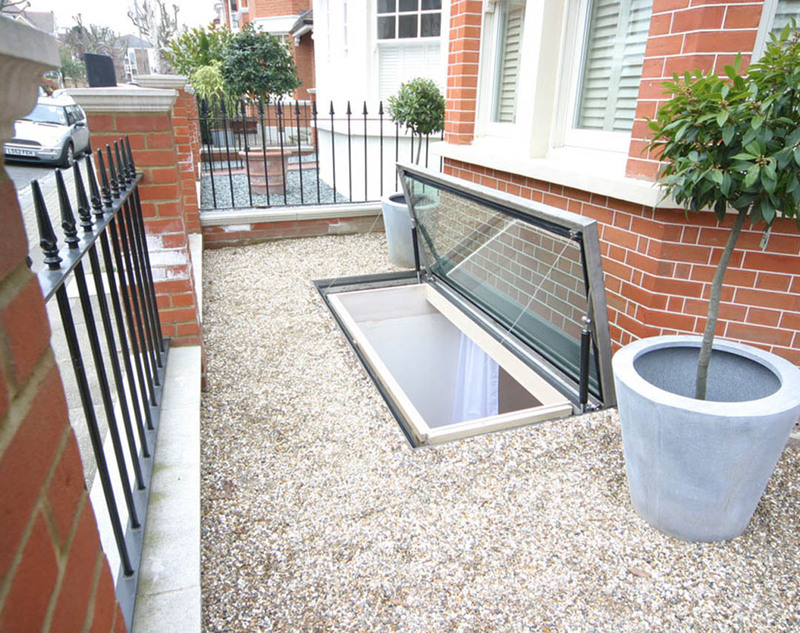 When closed, the system allows natural light into the basement whilst providing a weather proof, insulated closure. It is fitted with walk-on glass so people can safely move around the front garden without balustrades or other protection. It is fitted to be flush with the surrounding garden surface to eliminate any trip hazard, and yet still be watertight. This is achieved with specialist interlocking drip and water seals along with customised upstands and a buried gulley system. To achieve the vent position the roof can be raised up as far wanted to a maximum void of no more than 100mm, limited to conform with building control concerns for falling objects. This allows air to ventilate from the basement. Light rain cannot enter in the vent position. In the event of a fire, the full open escape system is activated by releasing a knob in the basement, and the roof-floor will open fully on automated springs in approximately 10 seconds. Occupants can then use the internal steps to safely climb out of the basement and exit. The inner wall ram geometry and relatively small size of this 420kg unit means it can be opened by gas springs; larger plates of glass would need hydraulic cylinders to provide sufficient lifting power. In either instance, we strive for ultimate elegance and reliability as well as the practicality of use and simple maintenance routines. Replacement of an existing poorly performing basement fire escape at the front of a period house. 2.6m by 1.1m.